The Marines were treated like heroes at the airport after a retired Marine and some others were not going to let them make the final leg of their journey to San Diego without thanking them for their service. It didn't matter that the 13 Marines on their way home from Afghanistan had been fighting in a war that no longer dominates the news or that they were stopping only for a short time in Chicago before flying to San Diego. When USO volunteer John Colas heard with just an hour's notice that the Marines' plane was bearing down on Chicago's O'Hare International Airport, he and others scrambled to make sure they got a hero's welcome. "We want these kids coming home to realize that they haven't been forgotten," said Colas, a 74-year-old former Marine. The reception started with a water salute in which their plane taxied underneath an arch of water from fire truck hoses. The Marines, who had spent the better part of five days getting on and off planes to get home from the other side of the world, were then met by a small crowd of cheering USO volunteers, firefighters, police officers and airport workers as they walked into the terminal. A short time later, boarding another jet for San Diego, the Marines learned that American Airlines -- which has a policy to upgrade servicemen and women in uniform whenever possible -- had six empty seats in first class for the group. That gesture was followed by seven first-class passengers who jumped out of their seats for the other Marines so they could sit together. "It was incredibly touching," Capt. Pravin Rajan said in a telephone interview after returning to Camp Pendleton in California. "Afghanistan is a very complex and ambiguous war ... and a difficult thing to keep track of so it is amazing when we are 10 years (into) a war and there is still that kind of community, that level of support, the level of willingness to go out of one's way." The welcome home started with a phone call. 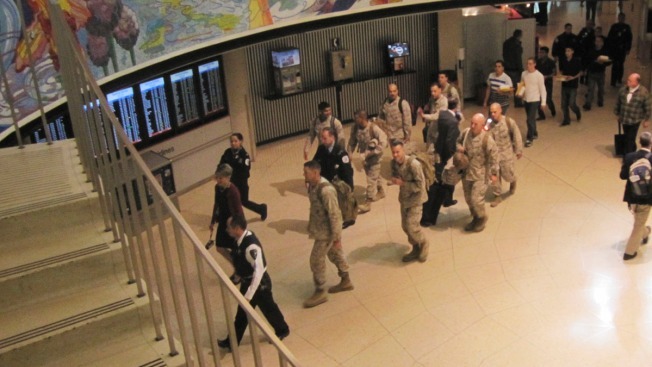 Stephanie Hare, a native of Illinois who now works in England, called the USO at O'Hare and explained that her fiance, Rajan, who had served seven months in Afghanistan, was with a dozen other Marines on a plane bound for Chicago from Baltimore. "I just thought if they could get them some Chicago pizza, champagne or something, that would mean a lot," she said. On the other end of the line was Colas, whose duties include welcoming servicemen and women. He told Hare he'd try to do something in the hour or so before the flight landed. But Colas cautioned that while volunteers make an effort to welcome military personnel whenever they come through the airport, he wasn't sure he could pull anything off in such a short time. Nevertheless, he got on the phone with the police and fire departments, the airlines and anyone else he could think of. "There must have been 15 Chicago firemen and an equal number of Chicago police and they formed a corridor for the Marines when they got off the airplane," he said. Rajan said the Marines didn't know what to make of it, starting with the slightly unnerving experience of looking out a plane window to see a fire truck. "For a second, we were like, `Are we in trouble?"' he said. After they realized the reception was for them, the Marines soaked in the scene, even as they said police officers hustled them off to another gate so they'd make their flight to San Diego. "They were just so thankful -- very, very appreciative," said Linda Kozma, an American Airlines employee who helps military personnel flying in and out of O'Hare. Hare didn't know about any of it until she woke up Tuesday and heard Rajan relating the whole story in a voice mail. "I just thought it was really beautiful," she said.